I find AnyMeeting good for training clients, you can hold a meeting with a large group of people via email invite. The client does not have to download any software which minimizes the time it takes to start and get everyone going. It does lack in high end video quality and there are better packages available. Other than that it can get a little pricey but there is a free version available. AnyMeeting is extremely easy to apply…. AnyMeeting is extremely easy to apply. Just look into the network and add details about the meetings, post the addresses of your own visitors and press the schedule key, and AnyMeeting will send an invitation to your visitors, where they can participate in your meeting. AnyMeeting will send you a notification before the scheduled meeting. Anymeeting forms the main entry point for hiring in my business. I do it professionally in an organized manner. The registration page, information and settings are considered asset multipliers. With AnyMeeting, you can easily draw up a plan, hire, attend, observe visitors and investigate the effectiveness of the presentation. In some cases, users experience difficulties if their Internet service is slower or the programs spend more traffic. AnyMeeting has made it easier to meet with team members and clients throughout the country. I use the dedicated conference line and it was simple to set up. Occasionally, there are issues with feedback or timing delays/echoes to the audio during conference calls. Free version…has limited features, but the basics are there. Sound quality is okay, as is the connectability. This was by far one of the easier webinars to setup. I did the trial version with about 5 different companies. This was the easiest with a great feature set and pretty good video quality. The only one I liked better was Adobe Connect but user had to download a large software app for Adobe which was a non-starter for me. Great poling software and registration setup. Slightly fewer features than Adobe connect but the ease of use off set any limitations. Highly recommend the product. Flexible interface. Easy to setup. Professional looking. 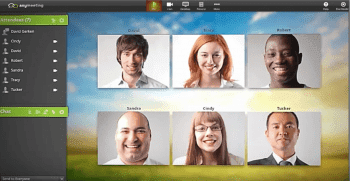 AnyMeeting is a web conferencing platform that launched in 2011. AnyMeeting is designed specifically for small businesses and can be used for webinars, online meetings, video conferences and/or conference calls. It can be used internationally and works from mobile devices. AnyMeeting offers three very affordable pricing plans as well as a completely free Lite version, which supports meetings with up to four people. AnyMeeting has a reliable and powerful web platform which utilizes WebRTC technology. VoIP is also included in the platform and toll free numbers can be added to any package starting at 6¢/minute. AnyMeeting’s paid packages also come with many helpful features including screen sharing, persistent conference call number with pins and custom branding. 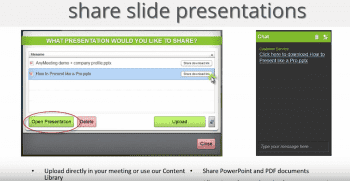 Additionally, AnyMeeting’s platform allows users to upload and share slides and videos. What Do You Think of AnyMeeting?